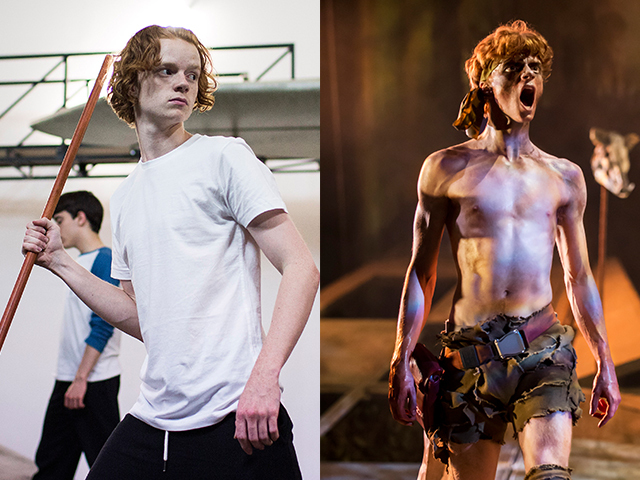 Freddie Watkins in rehearsals and on stage in Lord of the Flies. So we’ve returned, quite poetically (or pretentiously, whichever you prefer) full circle to London, Bromley. I can say without a doubt this has been one of the most formative and educational experiences I’ve ever had. Not only in the honing of a profession I hold dear, but also in a strange sort of physical/mental adaptation to the lifestyle of The Tour. During my time seeing the nooks and crannies of England, meeting audiences young, old, experienced, new, I have been simultaneously fulfilled to extremity, and exhausted to extremity. The various audiences, the techniques in dramaturgy, and the general chance to really understand what big theatre is about, have been worthy incentives for the hard work. Last week in Newcastle I spoke to someone who had seen the show in Belfast, and had just sat their GCSE’s on Lord of the Flies, they had apparently engaged in class because of the play. I just thought (and as it is the end of the tour, I think I’m allowed to get a little bit sentimental), it’s the small moments like that which really gave some meaning to it. To sum it up, it’s been a pleasure. One big, old, educational pleasure. Both on stage and off.